This year the Russian Engineering Union is celebrating its first jubilee. Within five years the organization not only united the leading companies of the country, but became a powerful driving force. The important step was made last year, when a new political trend connected with participation in All- Russia People’s Front arose. Today the activity of the Russian Engineering Union has a practical not a declarative character. The work is concentrated on the decision of the key problems concerning the improvement of the Russian industry competitiveness. Thus, one can surely say that within five years the Union turned from an industrial group into a remarkable social and political force of a federal scope which successively champions domestic producers’ interests. The Union pays particular attention to young specialists’ work in the industrial sector, the transfer of cumulative skills and knowledge to young engineers. The important event for exchange of opinions and communication became the annual international youth industrial forum “Engineers of the Future.” This year more than 1,500 Russian specialists, scientists, postgraduates and students met for the second time on the shore of Baikal Lake. They represented 355 industrial enterprises and more than 50 leading technical institutes. 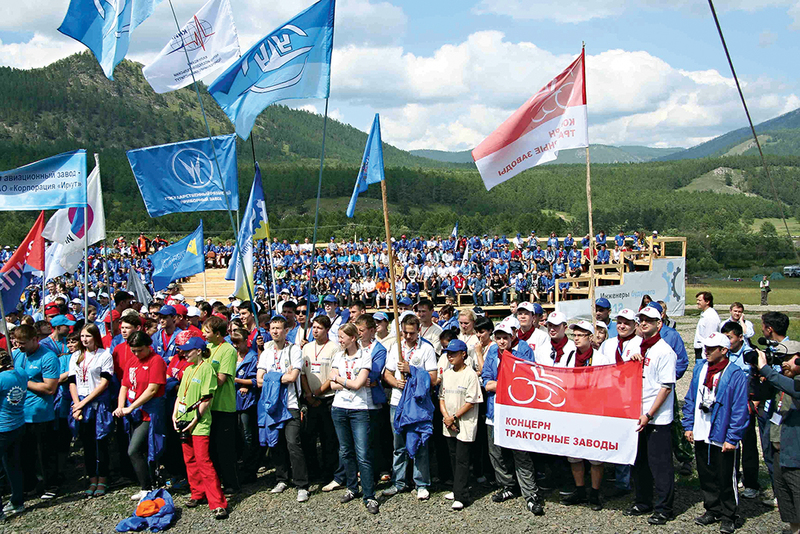 The organizers of the young specialists’ rally also were the state corporation “Russian Technologies” and the government of the Irkutsk Region. While opening the forum, the vice-president of the Russian Engineering Union, the president of the Irkut Corporation Alexey Feodorov said that “the most respected profession in Russia is the profession of the engineer.” In his opinion, only engineers are capable to really advance the country. A lot of meetings of young engineers with representatives of first-rate industrial Russian companies took place at the forum. More than 40 organizations participated in the training program; among them are the Ministry of Industry and Trade of the Russian Federation, the United Industrial Corporation Oboronprom, the state corporation “The Bank for Development and Foreign Economic Affairs (Vnesheconombank)”, the public company (pc) “Russian Railways” and the pc “ Sukhoi”, the Federal State Unitary Enterprise (FSUE) “TsAGI”, a group of companies “ Askon”, pc “Electrostal Heavy Engineering Works”, the corporation “Autodesk Inc.”, the FSUE “Gas-Turbine Engineering RPC “ Salut”, pc “ Avtovaz” and the pc “RVC”. Even the final day was not an idle one for the forum participants. They had the talk with the First Deputy of the State Duma Committee for Industry, the first vice-president of the Russian Engineering Union Vladimir Guteneyv. The deputy and young engineers discussed the development of domestic industry and its branches, particularly a possible pay rise at industrial enterprises and youth prospects. Vladimir Guteneyv said that the Russian Engineering Union had often taken a lead in initiatives on attracting young specialists to engineering professions. “Thus, we offered to introduce a deferment of military service for students of specialized secondary educational institutions; so young people are able to acquire all necessary skills before the draft,” he said. “The Union became the originator of All Russian Program on Practices and Probation for students of technical institutes at engineering enterprises. Since 2010 we have been conducting “The National Research Conference” where young scientists from the whole country send their projects. But the most essential thing we are proud of is our constructive dialogue with the leaders of the country. All our developments on increasing prestigiousness of engineering professions are supported by the Russian Government and personally by President Vladimir Putin”. In accordance with the results of the forum, the hosts of the rally – the team of one of the first-rate aircraft enterprises pc “Corporation Irkut” –were chosen as the best. According to Alexander Veprev, Director General of Irkutsk aircraft plant, some of the ideas suggested at the forum will possibly be introduced into the production process. The priority is given to projects on database management and the provision of structural and technological services. This year the MAMI representatives told young specialists about possibilities of three-dimensional modeling, showed a ready-made product – a detail copy made on a three-dimensional printer. CAD-modeling and 3D-print are widely used at Russian industrial enterprises. For the next forum they are going to work out a week’s training program with granting a certificate after its completion. There are a lot of tasks for the Russian Engineering Union to be solved, particularly in connection with Russia’s joining the World Trade Organization. However the Union intends to continue strengthening and consolidating its personnel potential within its industrial development.